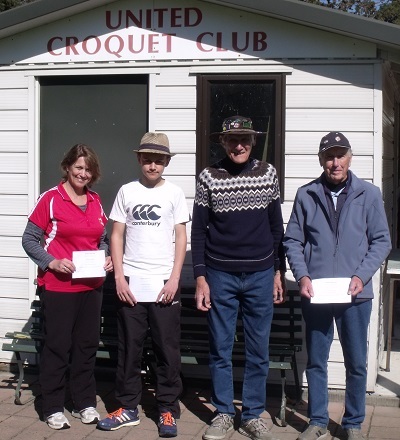 The second United September Golf Croquet weekend tournament was held on Saturday 10th and Sunday 11th September 2016. An AC event has been run in September for several years and will be held 24th and 25th September. 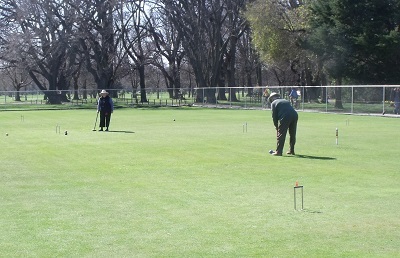 The new Golf Croquet handicap regulations came into effect from 1 September 2016. The manager had a busy time updating and issuing new AHS cards for several players who had not had their old one updated. The weather was kind with no rain and plenty of sun for his time of the year. Rain in the days before the weekend meant that the lawns had not been mown and were rather long. They were finally mown after the first day’s play. Four players entered the Open event. It was played as a triple round robbin with five 13-point games played the first day and four the second. Edmund Fordyce (Waireka, South Canterbury) won eight of his nine games to take the event for the second time. Edmund’s new handicap is -3 (compared to his previous 0). With one loss, his index points reduced in spite of winning the event. Neil Williamson (Hornby) was runner-up with five wins. The handicap event had a field of nine and was played as a round robin with five rounds games on Saturday and four on Sunday and each player having one bye. The winner of the handicap was Alan Belcher (Hornby) winning all 8 of his games. Carolyn Fordyce (Waireka, South Canterbury) was runner up, losing only to Alan. Full results are on Croquet Scores.